Let's continue with the "meat and three" dialog from last week, with one more side dish, if you don’t mind. 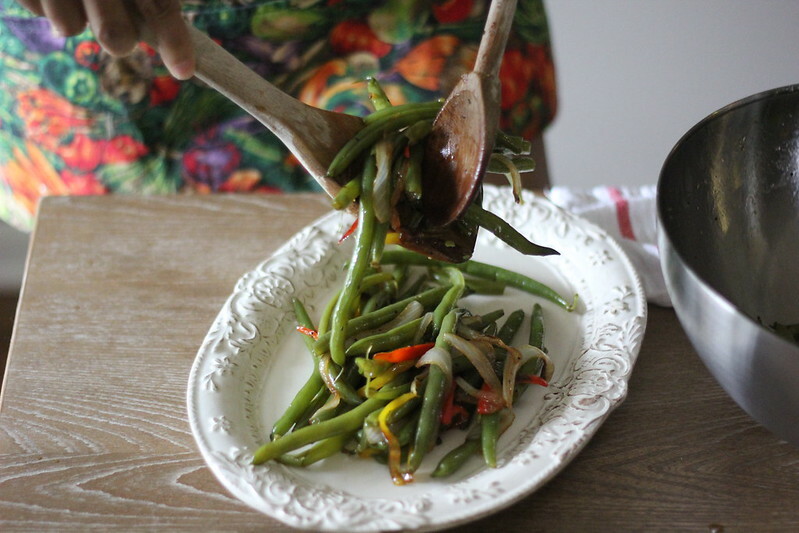 Onward with "string beans" .. those long green poles that are tucked away in casseroles or boiled in a stock pot full of pork bits and butter. Often leaving little yellow puddles of grease along the way. Certainly I prefer them in this manner; with the grease puddles that is. Be that as it may, I realize that for some of those living outside of the southern-fried world that I grew up in, grease is the devil. For a southerner, the devil looks more like a jar of miracle whip, however that is a conversation for later. My Aunt Mabel would cut a major side eye at this recipe and ask me where the hell is the pork fat that should be simmering in these greens... that would be after my grandma asked why the hell I didn't "snap'em". Once the beans were prepped, they spent hours stewing in large pots. Which produced melt in your mouth greens of glory; with odd coloring. 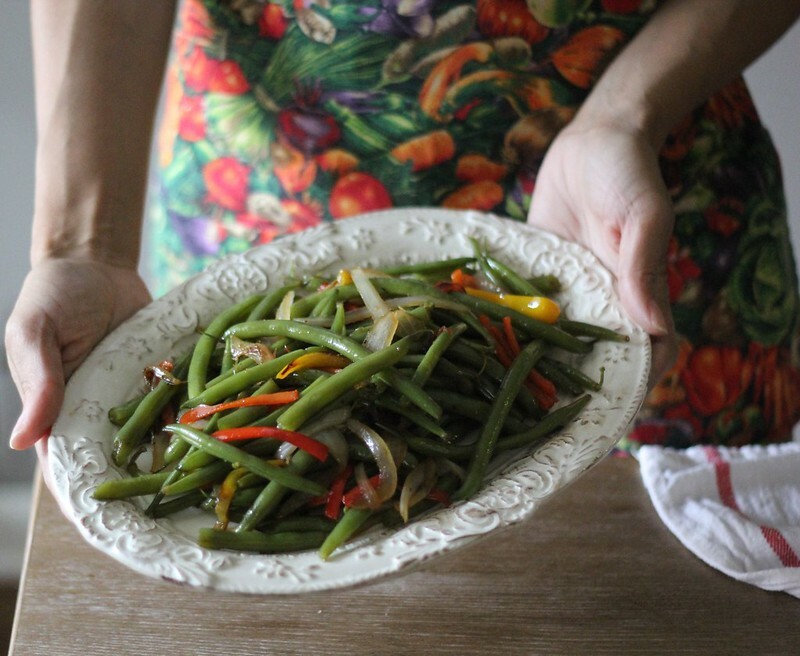 I can recall countless times, sitting on a stool snapping the ends off of green beans. So much so that it wasn't until college at this little diner, complete with checked table clothes and crackled seat spinning counter stools, that I had a run in with a different type of green bean. In an effort to ease my pangs of homesickness and longing for greasy chicken and whipped up mashed potatoes, I ordered the "country special". Quickly, I found solace in a plate of crispy golden friend chicken, cloudlike potatoes with a well of peppered gravy and string beans so vibrant in color I thought they may have been plastic. Not to mention they were crunchy and came with the ends that granny used to so forcefully snap off. Did I say they were damn good, that bares repeating. So good that when the waitress brought me a second helping, I timidly asked for the recipe, then found myself spellbound by a long conversation about her cousins famous pole beans and sea island red peas. Which made me completely unaware of the fact she never gave me what I'd asked for, the simple process of how one would recreate those greens. Still, it was here that I returned whenever that sense of home was missing, I could always find it somewhere on the menu. A plate of candied yams, pork chops smothered in gravy and string beans nestled together with onions and red hot peppers. As well as Ms. Kathy, the waitress originally from Greenwood South Carolina, who at times, would give me a free slice of pie when no one was looking. 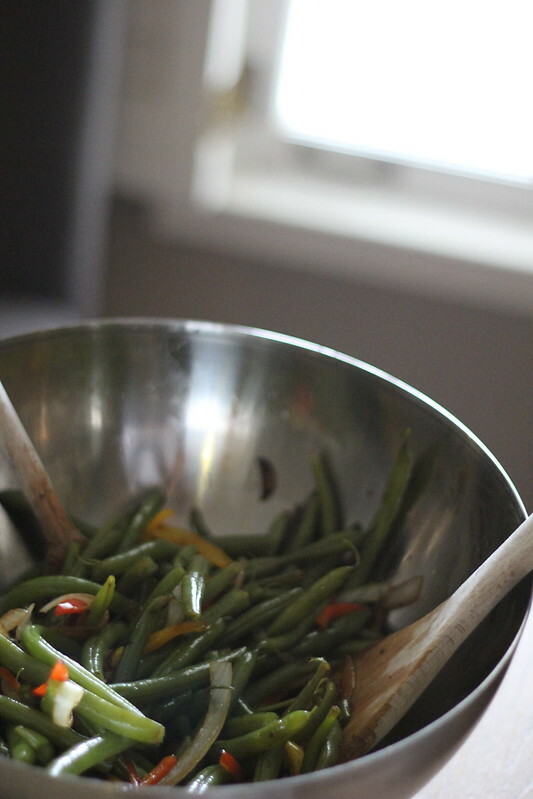 So here is my best rendition of those delectable green beans, complete with sweet peppers and onions.. Adapted from a recipe that I found in Southern Living magazine a few years back. Bring a large pot of water to a boil and add 1 tablespoon salt. 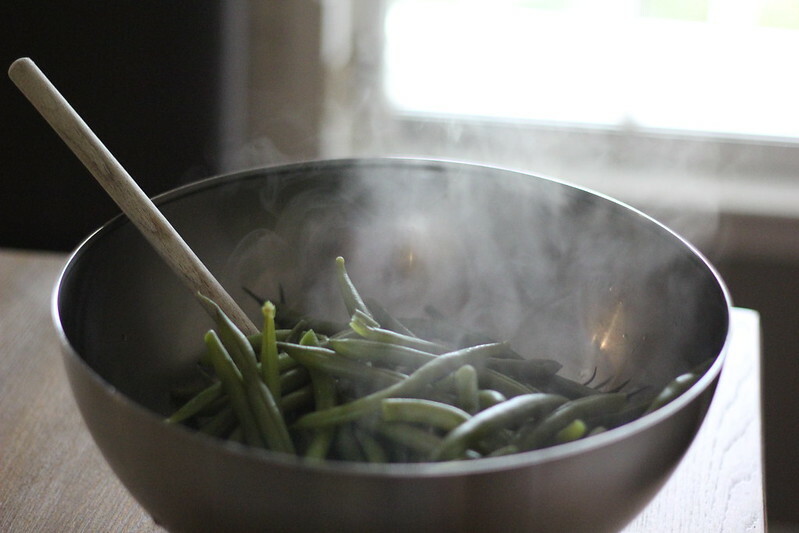 Add the green beans to boiling water and cook until tender; about 4-5 minutes. Drain and run under cold water to cool. 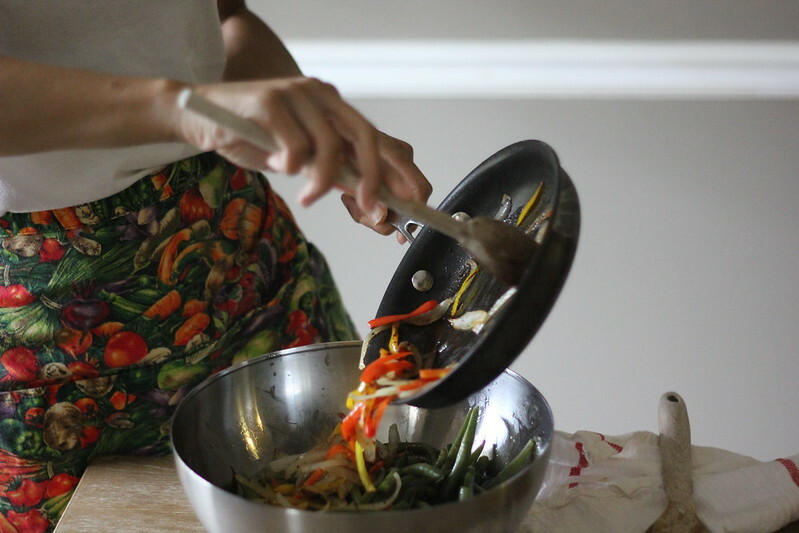 In a separate bowl stir together brown sugar, soy sauce and crushed red pepper. Set aside. In a skillet, heat peanut oil. Add in onion and sweet pepper slices and sauté over high heat for 3-5 minutes. Remove from heat. 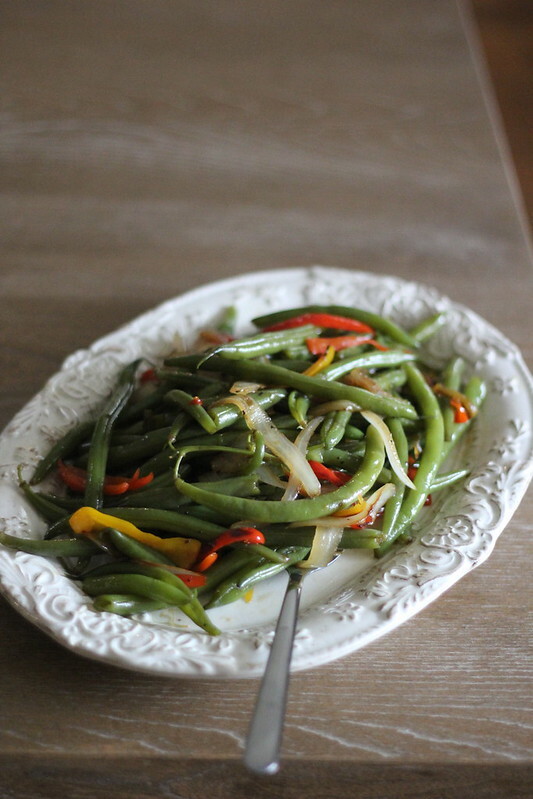 Mix together green beans with sweet peppers and onions. Pour brown sugar/soy sauce mixture over vegetables tossing to coat. Sprinkle with salt and pepper to taste.